Science isn’t to be squandered from the world. Here at Insanitek we believe that communicating the results of your research and experiments is of the utmost importance. Scientists aren’t a miserly bunch that squander precious knowledge. That’s why we created Insanitek Ink, the publications division. Besides publishing our own work, we offer several services for the general public and researchers of all areas. The copy editor does work that improves the formatting, style, and accuracy of your text. This is the first step in the editing process, so it does not involve changing the substance of the text. It is a copy editor’s job to make sure that your work meets the 5 Cs. To meet this standard, copy editing involves correcting spelling, punctuation, grammar, terminology, jargon, and semantics. Copy editing also involves ensuring that the manuscript adheres to the publisher’s style guide and length limits. During this process, we treat you not as a client, but as a business partner. After all, we are working with you to make the best piece shine through. We currently only work in English and with English speaking publishers. We have people on staff with a master of both British English and American English. However, we reserve the right to charge extra if the work is translated to English, but is particularly difficult to understand. Alas, we do not currently have the provisions to translate works from another language into English. We want to provide to our customers the most time- and cost-effective services, thus if this sort of situation were to arise, we would recommend that you seek out a different agency that can handle translation work. Investment cost: $40/hour or $5 a page. Proofreading is the last stage in the editing cycle before your manuscript goes off to the publishers for acceptance or denial. Think of this service as buffing out the rough edges and putting a spit-shine on the shoes for your writing. Proofreading services entail going through your writing with a fine tooth comb to correct the following: spelling capitalization punctuation grammar sentence structure subject/verb agreement consistent verb tense word usage. The proofreading stage is not the same thing as copy editing. This service does not involve correcting terminology, jargon, or semantics. Nor does it change the layout, fact check, or even consider the citation format. We currently only work in English and with English speaking publishers. We have people on staff with a master of both British English and American English. However, we reserve the right to charge extra if the work is translated to English, but is particularly difficult to understand. Alas, we do not currently have the provisions to translate works from another language into English. We want to provide to our customers the most time- and cost-effective services, thus if this sort of situation were to arise, we would provide a full refund and recommend that you see out a different agency that can handle translation work. Investment cost: $25/hour or $3 a page. I don’t want to go cross eyed. At Insanitek, science journalism is not dead, nor even dying. In fact, it’s thriving. This is our primary area of in house work, and we are happy to extend our services and expertise onto you. What journalism is embodied in the Cooper quote above. It turns science into a story and makes it more palpable to the general public without taking away the essential knowledge and accuracy. We can do this because we seek out journalists that are scientists first, journalists seconds. All our journalists have strong communication skills and experience working and teaching the public in a wide array of environments. This service entails: A rewrite of your research paper translated to journalistic styles and language for you to use in working with the public. Published copy of the translated research in Insanitek Ink publications, which is sent out to newsletters subscribers and broadcast across various social media outlets Any public friendly graphics we produce will also be licensed to you to use in your work. If you wish, for an additional investment, we can produce the material for posters, presentation, and possibly other teaching materials such as a hands on teaching outline. Involves everything for package B, then add a presentation, or hands-on teaching curriculum: $25Â additional for each medium. Looking to make an infographic poster instead? Check out the graphics tab for rates. We reserve the right to charge extra if the work is translated to English, but is particularly difficult to understand. We do not currently have the provisions to translate works from another language into English. We want to provide to our customers the most time- and cost-effective services, thus if this sort of situation were to arise, we would provide a full refund and request that you see out a different agency that can handle translation work. Research, writing & editing If you have an idea in your head, but you need some help researching, writing and editing it, we can do that. The cost is $50/hour or $7/page, plus recognition on the by-line to show our work. Please note, Insanitek Ink’s writers aren’t ghost-writers; they are real science writers and recognition should go to them as well for their hard work. The work will belong to you provided that it remains 85% in tact with the writer’s name on it. You can do with it whatever you wish with no extra charge, including selling it to another. The writer that helps you with it may use it in their portfolio as work they’ve done, and they may have it published somewhere with your written approval. Our graphic designers are what make the images in our papers and on this site beautiful and eye catching. They are keen to work with you to elevate your graphics to the next level, too. If you like what you see here, keep us in mind when you want to add wow to your work. Our graphic designers work at an hourly rate of $35/hr, which comes to about $0.58/min. This fee is pro-rated, so if a graphic is simple and only takes 15 minutes to create, it would cost merely $8.75. Got a longer, more complex project? They can do that too! Every project is unique, so contact us to get in touch with our design team to make the most of your ideas and concepts. I came here for an infographic poster! 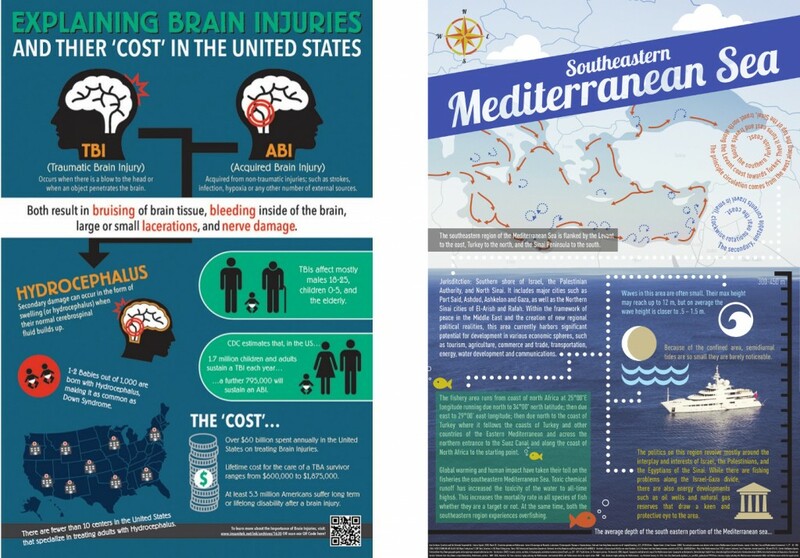 We love doing infographic posters. They are fun, unique, and are a great way to show your story, not just tell it, even when you’re not hovering next to the poster to explain.Â We take care to include descriptive text that tells your story, images that show your story, and citations to make it official. We use a combination of science journalism and graphic design to put together a comprehensive poster in the dimensions that you need. Full sized posters (3×5′) done by Grace and Rachel for clients in industry and academia. Both images are small versions of the full sized posters with varied complexity. Both posters were 3×5′ when printed and displayed. The investment to the clients? A mere $150 – 175 — including the cost of printing the poster and shipping it to their conferences for them. Remember, all projects are unique and these are just examples. Your investment costs will also be unique for your project. For a more comprehensive quote, please fill out a simple survey which you can share your vision. It is sent straight to our graphic artist team, so they will be in contact with you soon for clarifications and a quote. With the governments calling out for research to be economically or socially responsible to get funding, it’s more important than ever to remind the public and government about the true value of science and technology research. Our PR team works hard to make the work of the science journalists active and seen all over the web and in their local communities. Why not put them to work for you too? We have 5 different PR packages you can take advantage of so you can choose the one that best fits into your budget and needs. Copper Package ($50 – 100) depending how many weeks you want the campaign to run, up to one month): PR and marketing across the web is done through a variety of social media campaigns, Google Adwords, and other such pay-per-view ad. It works because the more people see things the more likely they are to click on it and learn more. Each platform has it’s own cost and effectiveness, so we use a combination of them for maximum effect at minimum cost. Silver package ($125): This package starts with the copper package and adds on our B science journalism package. This means you’ll get a rewrite of your research into laymens terms, beautiful graphics to enhance it, and your work broadcast across the internet in both science-ese and layman for the general public using a combination of tools such as low cost press releases like Science Codex, our company blog, social media, and submitting your work to Real Clear Science and Science Daily. Gold package ($200): In the gold package, you get everything from the copper and silver packages plus a presentation and a poster that can be downloaded and be used by teachers, museums, or anyone else in their curriculum. We also extend the online marketing to a month. Platinum package ($250): The platinum package involves getting everything from the copper, silver, and gold packages, plus volunteers from Insanitek’s network to go out to teach elements of your research in museums, fairs, science cafés, and workshops in such as way that educators can teach the knowledge in a fun accurate way to others. Major search engines: Google, Yahoo!, Bing, etc. Distribution to premium online publishers like New York Times, Scottrade.com, StreetInsider, International Business Times, etc. “ShareThis” feature makes it easier for your readers to send your news to others through blogs, Facebook, Twitter, Technorati, Digg, LinkedIn, etc. I’m ready to tell my story!